Sarah Nader- snader@shawmedia.com Chris Freund of McHenry parks his 1966 Chevrolet Nova during the opening night of the 5th season of the Green Street Cruise Night Monday, June 9, 2014 in McHenry. Green Street Cruise Night runs Monday nights through September 29. Sarah Nader- snader@shawmedia.com Grant Robb. 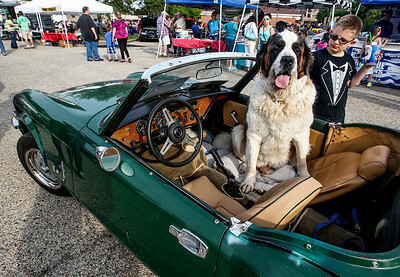 8. of Johnsburg pets five-year-old St. Bernard named, Bailey, while the dog sat in his owners 1976 Triumph Spitfire during the opening night of the 5th season of the Green Street Cruise Night Monday, June 9, 2014 in McHenry. Green Street Cruise Night runs Monday nights through September 29. Sarah Nader- snader@shawmedia.com James MacKenzie of Crystal Lake looks at a 1967 Chevrolet station wagon during the opening night of the 5th season of the Green Street Cruise Night Monday, June 9, 2014 in McHenry. Green Street Cruise Night runs Monday nights through September 29. Sarah Nader- snader@shawmedia.com Stuart Swanson (left), 18, of McHenry and Katelyn Hudjera, 19 of McHenry sit in the back of Swanson's Ford F150 during the opening night of the 5th season of the Green Street Cruise Night Monday, June 9, 2014 in McHenry. Green Street Cruise Night runs Monday nights through September 29. Sarah Nader- snader@shawmedia.com Keith Johnson 9left) of McHenry and Joe Laubinger of Lake Villa look at a 1964 Ford Falcon during the opening night of the 5th season of the Green Street Cruise Night Monday, June 9, 2014 in McHenry. Green Street Cruise Night runs Monday nights through September 29. Sarah Nader- snader@shawmedia.com Opening night of the Green Street Cruise Night was held on Monday, June 9, 2014 in McHenry. Green Street Cruise Night runs Monday nights through September 29. 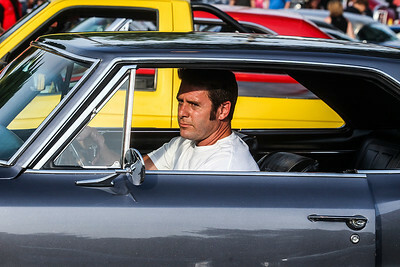 Keith Johnson 9left) of McHenry and Joe Laubinger of Lake Villa look at a 1964 Ford Falcon during the opening night of the 5th season of the Green Street Cruise Night Monday, June 9, 2014 in McHenry. 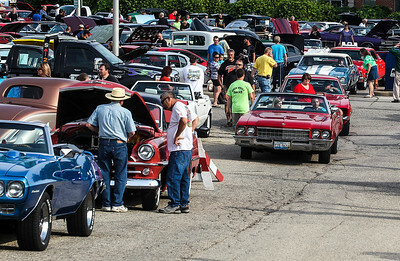 Green Street Cruise Night runs Monday nights through September 29.